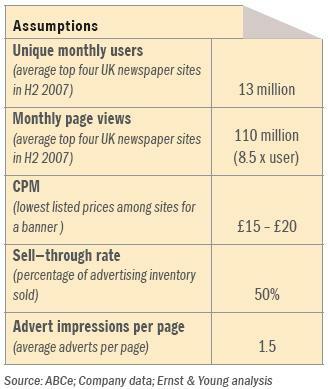 Rick Waghorn and Adrian Monck have already had a crack at the new Ernst and Young report (pdf) that claims the biggest UK newspaper websites made £15m-£20m in ad revenues each last year but could have made £120m-£250m by switching from a CPM model to Google's CPC model. Follows my contribution to the debate. What an extraordinary document it is. There are a few things to like about it (for example I can hardly now quibble with the claim that "2007 could be remembered as the year when Google, a company founded ten years ago, first overtook ITV1", having broken that news myself in February) but I echo Adrian's astonishment that more than one of the surveys included therein - see page 6 - seems to have been conducted by sending an internal email around 100 Ernest and Young employees (a group representative of the newspaper target audience? Well quite). And as for assumptions that go into the estimates of current online newspaper revenues ... where does the sell-through rate of 50% come from? Any number that round is probably a guess. In fact, let's go further - that number is certainly a guess since there are very few ways of estimating website STRs using publicly-available data and not one of them returns that result. Yet the accuracy of the whole model depends on that STR figure being right. Drop the STR to 25% instead and revenues under the model are halved: up it to 100% and they double. You can make any number you like come out at the other end just by changing this one guess - if STRs were set to 10% the model would show newspaper websites making just £2m-£4m a year instead of £15-£20m; at 90% £26m-£36m. What we are left with is a model for estimating online newspaper revenues that if it is right is right by chance; some strategies that are either already being pursued (invest in classified websites? O rly?) or have not been thought through (the aforementioned "news sites can be monetised in just the same way as search sites" claim); and the economically unsubstantiated claim that ad revenues will follow eyeballs online (why? Online could simply introduce greater efficiencies and reduce the size of the whole ad market. Look at Craigslist for how this is already happening). To be fair it is probably quite hard to summarise a whole industry's present and future prospects in seven pages. But this is not even a very good try.